Golightly, sleeping four + three, is one of four delightful stone barn conversions situated at Webbington Farm, a working beef farm in the beautiful Somerset countryside. Golightly, named after a famous racehorse who used to live in this stable, is an oak beamed cottage with modern facilities, finished to an exceptional standard. The spacious living space comprises an open plan sitting and dining area and a separate well-equipped kitchen. The sleeping accommodation upstairs comprises a triple bedroom with one double and one single bed, a twin bedroom and a bunk bedroom. The family bathroom has a P shaped bath with a shower over. The private patio to the front of the cottage is a delightful spot to sit and relax in at any time of day. The other three cottages at Webbington Farm are Kitty (sleeps 4), Poppy (sleeps 6 + 1) and Tiarks (sleeps 5 + 2). All four cottages can be booked together for larger groups to accommodate up to 18 guests. Tiarks has a luxury heated hot tub in a separate building. 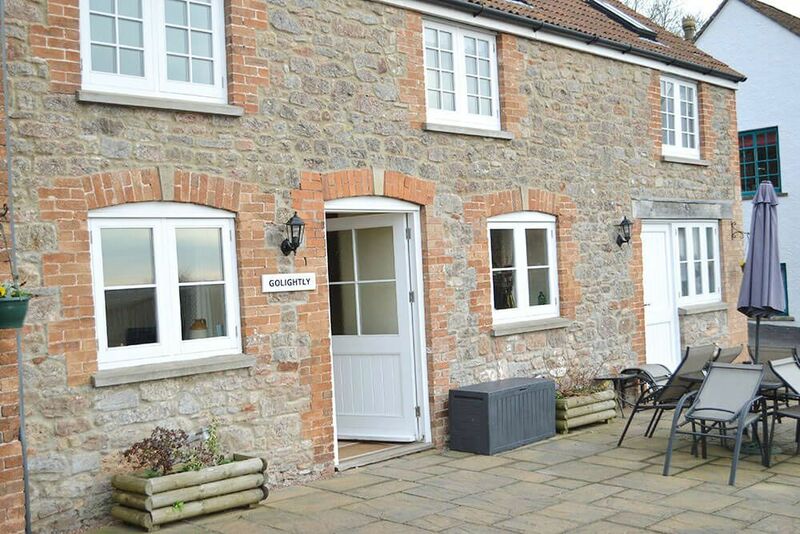 Please see Webbington Farm Cottages http://www.staycationholidays.co.uk/holiday/webbington-farm-cottages-somerset/ if you are interested in this option. Bedroom with 3′ bunk beds. Private large patio sitting area and shared use of a games room, children’s activity play area, large enclosed lawned garden and barbecue. The three other properties at Webbington Farm, Kitty (sleeps 4), Poppy (sleeps 6+1) and Tiarks (sleeps 5+2), can be booked with Golightly to create a large property for family get-togethers or groups of friends of up to 25 people. Cottages may be taken individually or in any combination. First floor: Family bathroom with a P shaped bath with shower over. Sorry, no pets are allowed at this cottage. Please bring your own swimming towels. If booking with Tiarks cottage, please bring your own towels for the hot tub. Minimum stay 7 nights during Summer High season. Golightly is nestled below Crook Peak on the edge of the Mendip Hills Area of Outstanding Natural Beauty, with scenic walks to its summit offering views of the Somerset Levels as far as Glastonbury Tor! Amidst Somerset’s famous cider making and Cheddar strawberry growing area, the location is ideal for guests looking for peace, tranquility and the great outdoors. Golightly makes a superb base for exploring the surrounding countryside and coastline. Within easy reach are the impressive gorge and caves of Cheddar and Wookey Hole, the cathedral city of Wells, historic Glastonbury, the Georgian city of Bath and the home of Isambard Kingdom Brunel: Bristol. For further retail therapy, Clarks Village at Street is an easy drive.